This comprehensive software solution streamlines the entire smart product development process, dramatically decreasing development time and costs. Seebo is a SaaS company offering a smart product development platform that makes it easy to build smart, connected products. The all-in-one Internet of Things (IoT) platform empowers everyone, from small startups to enterprise customers, to get smart products to market quickly, efficiently and cost-effectively. Seebo simplifies the complex process of going smart by offering automated planning and functional design tools, a smart Hardware Engine, forecasting tools, cloud and app integration, IoT simulation and a third-party marketplace. This comprehensive software solution streamlines the entire smart product development process, dramatically decreasing development time and costs. Leading companies worldwide have already launched products using the Seebo platform and more join every day to excite their customers, transform business models and improve end-user experience. The company operates from San Francisco, Tel Aviv and Shenzhen. For more information visit seebo.com or follow @seebo. What is Seebo’s value to its customer? Seebo decreases time to market, reduces development costs and generally simplifies the process of developing a smart, connected product. 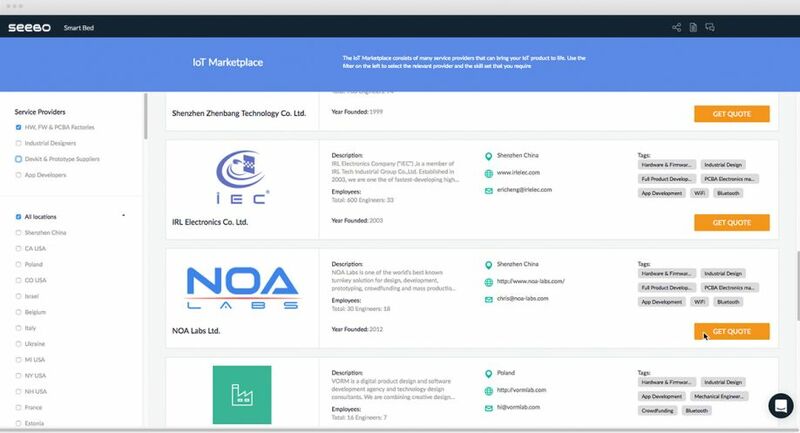 Companies from all industries -- with technical teams or without technical teams -- can use Seebo’s comprehensive platform to take IoT products to market quickly, efficiently and cost-effectively. Seebo provides value to its customers during each stage of smart product development, from planning, through development to pre-production, by offering a comprehensive software platform that offers reliable solutions to address the challenges along each step of the journey. How is the Seebo all-in-one IoT platform uniquely designed to take smart products to market quickly and cost-effectively? Seebo offers a comprehensive all-in-one development platform that makes smart product planning and development smooth and hassle-free, so that smart products can be taken to market quickly and cost-effectively. The platform reduces development time and costs by enhancing communication across distributed teams, multiple stakeholders and relevant marketplaces. It offers various tools that help product developers to overcome common challenges encountered during the smart product lifecycle, helping to cut time to market and reduce costs including: automated design tools, a hardware and costing engine and access to IoT Marketplaces to source third party services. 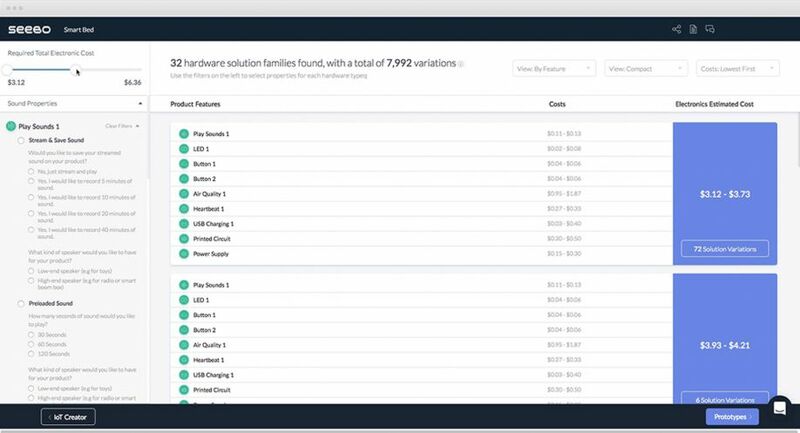 Using the Seebo platform, engineers and developers — including product, app, software, firmware and hardware developers — all have access to the comprehensive product specifications tailored to each field, that are necessary for a seamless, quick smart product development process which saves considerable time during product development. The platform enables users to share product concepts with stakeholders, and engage and source third parties via Seebo Marketplaces to facilitate getting the smart product to market quickly and cost-effectively. Can you tell me a bit more about how specific features of Seebo’s IoT platform help users to reduce time to market and reduce development costs? 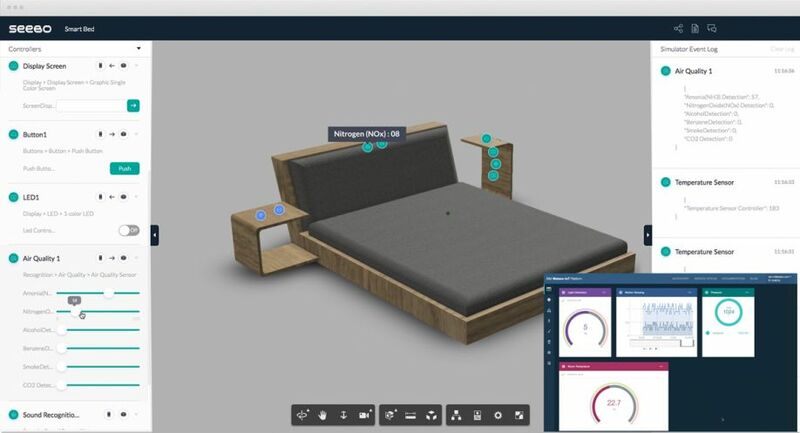 Design of the product starts with the IoT Creator (see image 1), where the basis of the product’s functional design can be quickly created by assigning features to an image or a 3D model of the product. The selected features are translated by the Hardware Engine into cost solutions (see image 2), which can be used to forecast the costs of creating the smart product. The Hardware Engine helps to save development time by suggesting numerous possible hardware architectures and auto-generated block diagrams. This enables the platform user to choose the most efficient, cost-effective solution for the product concept quickly and painlessly. The Hardware Engine solutions are then used to create the specifications to order a prototype (see image3 ) and access Seebo’s IoT marketplaces (see image 4) to source a hardware, firmware and app developer to create the prototype and develop the final product. 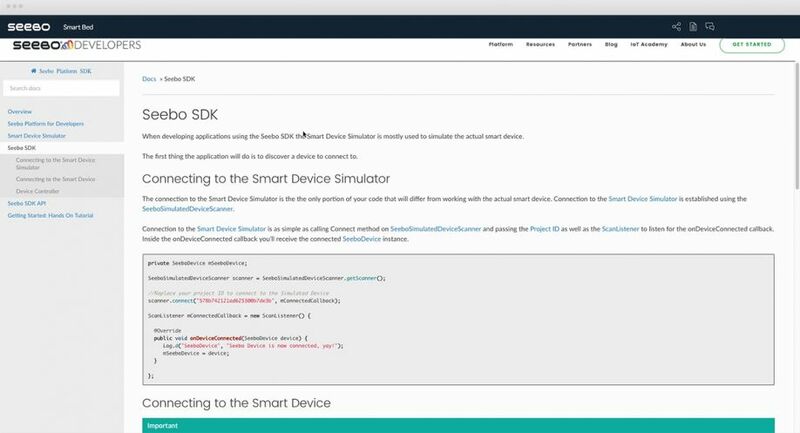 The web and mobile apps are developed using the Seebo SDK (see image 5) and the Smart Device Simulator (see image 6) and the firmware and the hardware are tested using the Seebo Testing App (see image 7). How does Seebo’s platform help end-users create uniquely innovative smart products? 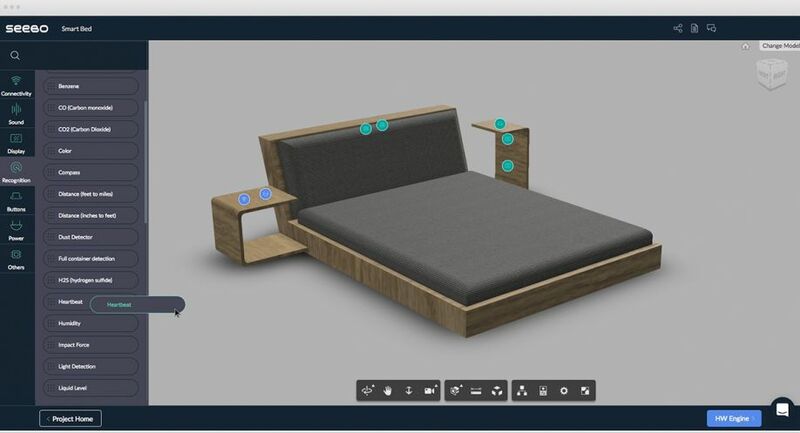 Seebo’s virtual IoT product planning environment gives manufacturers and product developers the tools to ideate, explore and validate use cases, and assign IoT hardware to a 3D product model – to identify and match the right hardware solutions to fit unique product concepts designed to meet the needs of customers. 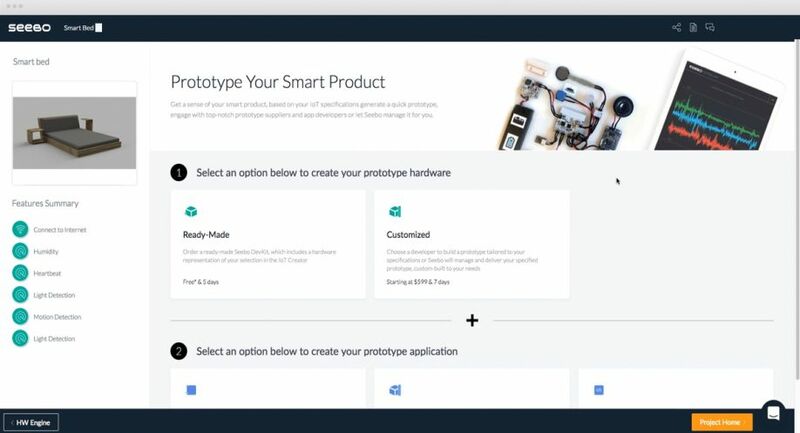 By providing the tools to develop and build a smart product based on a wide array of behaviors and hardware components -- and allow users to iterate quickly and easily -- the Seebo platform enables users to bring to market uniquely innovative smart products, limited only by the imagination of the end-user. Why is it so important to provide manufacturers with the tools to create smart, connected products? Smart, connected products are the products of the future. "Gartner, Inc. forecasts that 6.4 billion connected things will be in use worldwide in 2016, up 30 percent from 2015, and will reach 20.8 billion by 2020. In 2016, 5.5 million new things will get connected every day” and that adoption will occur across all industry sectors. In the electronics industry alone, 91% of business leaders say the Internet of Things will reshape their organization’s brand identity. *IBM Institute for Business Value. “The Business of Things: Designing business models to win in the cognitive IoT” December 2015. According to the IDC "US organizations will invest more than $232 billion in Internet of Things (IoT) hardware, software, services, and connectivity this year." IDC, 2016. Leading companies innovate - companies can either be leaders or followers. Build a relationship with your customer. Be there when they are ready to spend next. Can you provide examples of some of your customers and describe how Seebo helped them to build innovative smart products. Mookie Toys - Mookie is a leading international manufacturer of branded toys that span across multiple categories. Established in 1987, the UK toy supplier promotes a world of play and has been an inﬂuential force in its industry for over 25 years. While looking for opportunities to expand its line of toy products, Mookie wanted to address the growing popularity of smart, connected toys by developing and manufacturing its own. Mookie Toys used the Seebo platform to produce Story Stars, which are smart dolls with unique features, including the ability to play songs and tell stories. The in-market insight provided by the IoT platform led to new business models and an optimized toy product with increased ROI for Mookie Toys. Seebo delivered a quick time to market without the client hiring a single new designer or developer, and Seebo’s Professional Services ensured that every step in the complex design, development and production processes ran on time and on budget. Mookie Toys smoothly entered the world of IoT through connected toys. Cabbage Patch Kids - Wicked Cool Toys ( WCT) is an innovative toy company founded in 2012 and is an emerging leader in the diverse toy market. The company designs, manufactures and markets toys for all ages. WCT is the current master licensee of the Cabbage Patch Kids dolls. CEO Jeremy Padawar’s product team worked with the Seebo platform to create a winning smart concept. They used the Seebo IoT Creator to define the smart features they required for the Cabbage Patch Kids doll, including innovative colored LCD eyes that are revolutionary in the toy industry. The LCD technology enables the unique eyes to communicate emotions which, combined with motion, touch and other sensors, simultaneously provide a human experience and elevate the doll’s famous appearance. Using Seebo’s Hardware Engine they were able to forecast costs and find the most cost-effective and efficient solution to build the smart doll. Using the Seebo smart product platform, WCT rejuvenated the iconic Cabbage Patch Kids doll and demonstrated the value that an IoT platform creates for its clients: Automated smart product design and development that accelerates time to market at low cost. IoT technology is helping a generation of tech-savvy children strengthen their relationship with toys and empowered Wicked Cool Toys to transform traditional business models, enhance user experience, and increase product value. The CloudTot infant sleeping solution (designed for use with the DockATot baby lounger) - The CloudTot infant sleeping solution was created by Enfant Terrible Design, a company that designs and produces specialized designer baby and children’s fashion and goods. The company used Seebo’s platform to build a smart baby sleeping solution, designed to complement the DockATot baby lounger, and provide state-of-the-art features not yet available on the market. Using the Seebo platform designers at Enfant Terrible were able to add smart features to create the CloudTot infant sleeping solution to help parents provide maximum comfort and protection for their babies. These features include a baby awakening system, a moisture detection system and a device to monitor the temperature of the baby’s sleeping environment. Using Seebo’s platform, Enfant Terrible were able to bring the CloudTot sleeping solution to market quickly and cost-effectively. What is your understanding of the Industry 4.0 trends and how does Seebo fit into that? Industry 4.0 is part of a larger trend that includes smart industrial factories, smart cities, smart hospitals, smart retail stores and more. Each one of these unique systems is build from a set of products that are connected to each other and to the cloud. 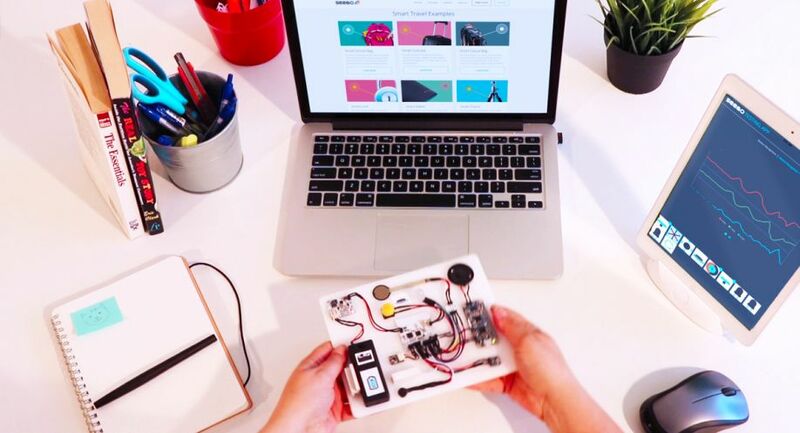 By making it possible to build any kind of IoT product, the Seebo platform give customers the tools at their fingertips to develop the crucial parts of those systems, which are the products.